Even though the market of personal computers has slowed down in the recent years, the PC continues its rapid development. Not only PCs are becoming more powerful, but they also change their form-factors. According to market analysts, one of the most promising segments of the PC market is the segment of highly integrated small form-factor systems. 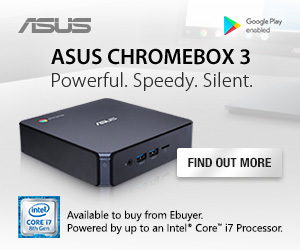 Apparently, Intel Corp. pins a lot of hopes on such computers. When Intel ceased to develop its own PC mainboards several years ago, the company specifically said that it would continue to pursue promising new form-factors, such as NUC [next unit of compute]. Since then, Intel has introduced several other miniature PC standards, which can be used for desktop computers. For example, this year Intel rolled-out its 5×5 and compute stick form-factors in addition to the code-named “Mini Lake” reference design. 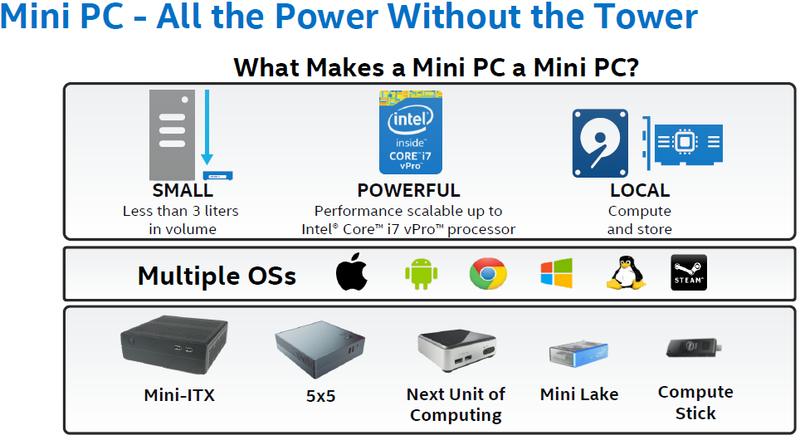 In fact, at present Intel promotes five small PC specifications, including mini-ITX, 5×5, NUC, “Mini Lake” and Compute Stick. All these form-factors address very specific segments of the market and in many cases probably overlap. That overlapping may not necessarily be a problem since broad choice of SFF types allows Intel to sell various microprocessors for such PCs, including ultra-low-power Atom system-on-chips, value Celeron processors, advanced Core i5 chips or high-end Core i7 central processing units. International Data Corp. believes that total available market of mini PCs this year will reach six million units and will grow to eight million units in 2018, not a lot for Intel, which sells hundreds of millions of microprocessors per year. However, keeping in mind that the market of PCs in general is shrinking, it makes a great sense for the chip giant to offer CPUs for PCs, which sales are actually growing. 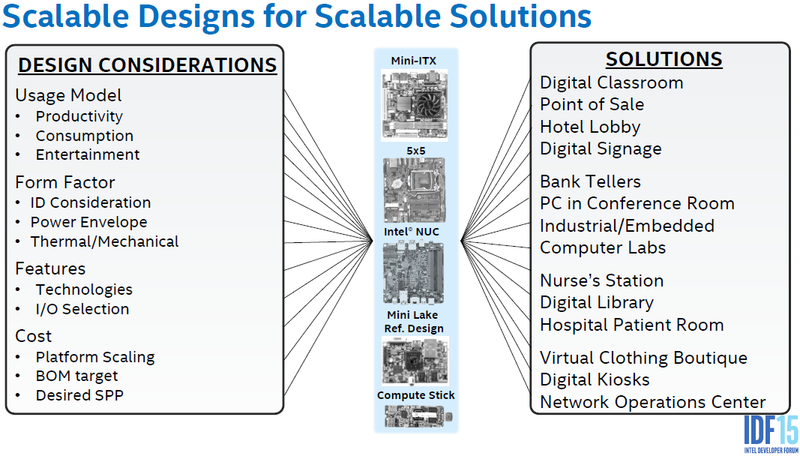 In addition, Intel believes that small form-factors allow it “take computing into new areas and usages not possible before,” the company revealed at the Intel Developer Forum earlier this month. Expanding total available market of PCs is something that is strategically important for the chipmaker. KitGuru Says: In a bid to sustain its sales, Intel addresses niche market segments that previously were not considered to be viable. Does it make a lot of sense for the company? Only time will tell!